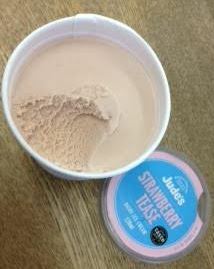 There’s something absolutely brilliantly amazing about ice cream that uses quality local ingredients. It always tastes better as though the love and care of the people making it seeps into the very fabric of the food. 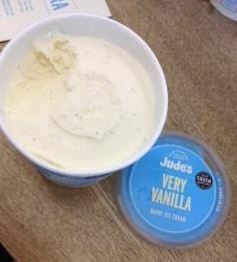 It wasn’t surprising to me after discovering Jude’s Ice Cream in the freezer of the etc Venue I was teaching at. The one I think that came out on top because it is awesome is the Truly Chocolate. I have to admit that I prefer the current chocolate with the bits but the new one is pretty lush as well. 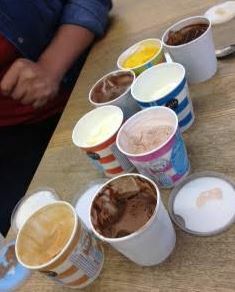 The whole office got involved and agreed that the chocolate was the stand-out best flavour. Of course they are as nothing compared to the Valrhona! 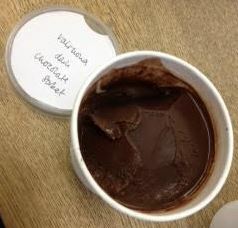 Well, the Valrhona was absolutely delicious! 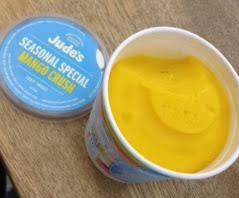 I had to finish that – being generous – as we have no freezer. 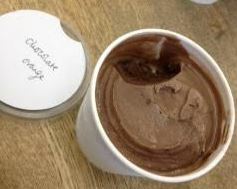 The Valrhona chocolate was quite different as it was a sorbet but it was SO CHOCOLATY it is perfect for anyone who needs to go dairy free and wants quality. 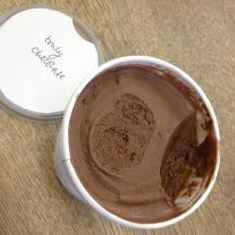 This is a delightfully rich and chocolaty sorbet. It is delicious! The Christmas pudding and ginger were also delicious and extremely good flavours. The Christmas pudding one I think is only available to hotels and so you can only get it on a menu but it is WELL worth making a special visit. 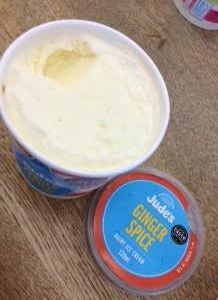 The ginger was the most brilliant accompaniment for ginger lovers. I’m not a ginger lover (outside gingerbread at Christmas) but it was loved well. Very Vanilla was a good, solid standard vanilla. It was absolutely delicious as a vanilla and the perfect blank canvas to paint on with sprinkles, chocolate sauce, strawberry sauce, caramel or anything really. Absolutely gorgeous! Best for last in the case. SALTED CARAMEL. 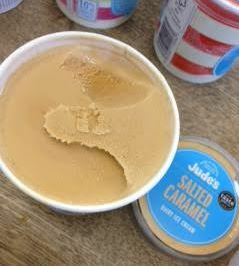 All hail the salted caramel ice cream. This was the most fought over pot of the whole batch. 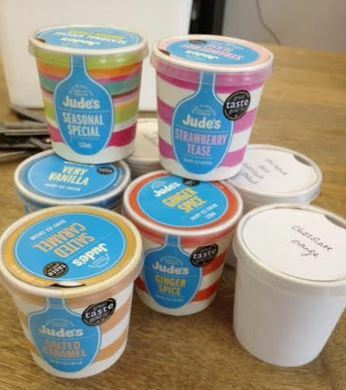 It was absolutely loved and several of the staff at the office are converted to Jude’s Ice Cream Salted Caramel. It is a creamy smooth lightly sweet caramel but cut in sweetness by the salt. That makes it a delightful delicious treat.